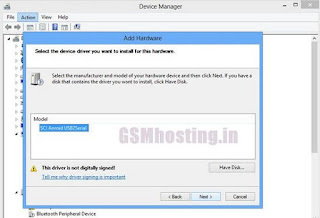 SPD Driver latest version helps you to connect your Spreadtrum Smartphone and Tablets to the PC without the need of installing the ADB driver or any other driver software. This latest SPD USB Driver is the latest and recently released with new and unique features. So click the official download link to download SPD Driver for your computer. Compatible with SPD flash tool. Follow the instruction to Install SPD USB Driver on computer Windows XP, Vista, Windows 7, Windows 8, wins 8.1, and Windows 10. Download Spreadtrum (SPD)USB driver on your computer. Go your my computer mouse right click select manage select Device manager. The driver is installed finish . Now you can easily download and install the SPD Drivers through the device Manager menu or by right-clicking on the INF file and selecting the install option. This latest SPD Android USB Driver is compatible with SPD Flash tool, which is used to flash Spreadtrum smartphones and tablets. The SPD Driver latest version also supports Flashing Box and Write IMEI tool, which helps you to Write or Flash IMEI on your Spreadtrum Smartphone and Tablets. If you need to download and install SPD Driver, then click the given link and download SPD Drivers for your computer for free of cost. Just tap the link and your download start within a seconds.